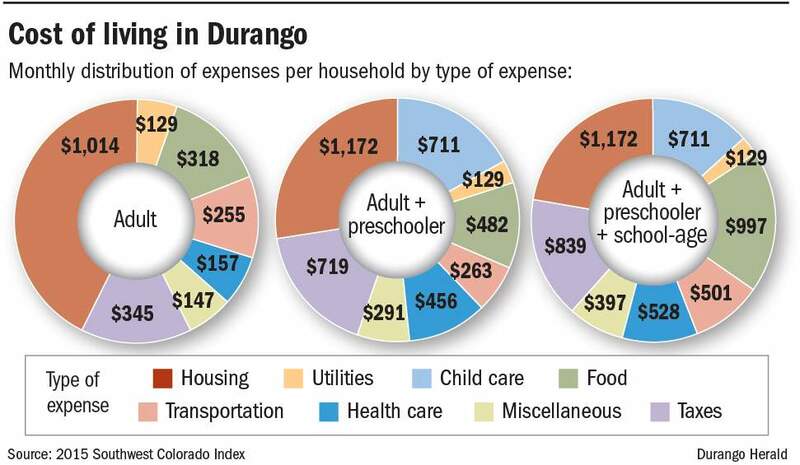 Most employment sectors in and around Durango do not provide enough income to meet the basic needs of a family of four, forcing renewed discussions about livable wages. Not surprisingly, Durango remains the most expensive community in the region, according to the 2015 Southwest Colorado Index. The recent report was compiled by examining housing and child care costs specific to each community in the region. 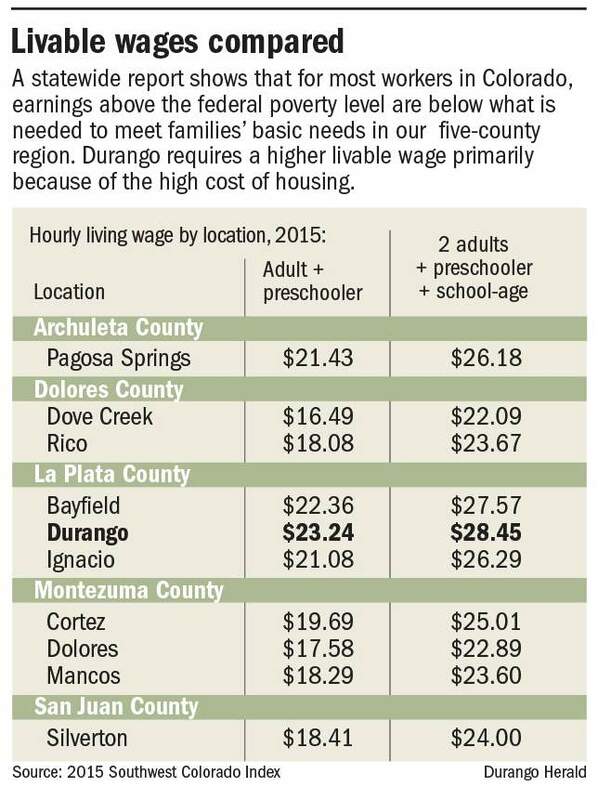 A family of four in Durango would need to earn $28.45 per hour to make a so-called “livable wage.” The high cost of housing is the largest contributor. The Southwest index measures the economic, social and environmental health for Archuleta, Dolores, La Plata, Montezuma and San Juan counties. Democrats in the last legislative session fired the first shot in an attempt to raise the minimum wage, or at the very least, empower local governments to do so. The legislation would have repealed a 1999 law that gave the state control over minimum-wage issues. With passage of the bill, local governments would have been allowed to establish minimum wages commensurate with the local cost of living. A separate resolution would have sent a ballot question to voters asking them to gradually raise the minimum wage from $8.23 to $12.50 per hour by 2020. Both efforts failed in the Legislature, with much of the opposition coming from Republicans and business interests. Business leaders said the measures would have squeezed certain entry-level workers out of the job market because employers would cut positions to adjust to new labor costs. They also are concerned the measures would have created a patchwork of uncertain local-wage mandates. But advocates for the proposals say they’ll be back, if not in the Legislature, then by placing the issue before Colorado voters next year. Durango City Council is currently working on solutions to the high cost of housing. For a one-bedroom dwelling, the Southwest Colorado Index found Durango residents pay a monthly rent of about $1,014, which is more than $270 over the $740 fair market rent for La Plata County. Maliszewski said beyond the housing issue, the livable wage discussion is about engaging the community and determining a direction for Durango. Does Durango go the way of tourist towns like Aspen and Vail, where workers are forced to live outside town limits because of high costs? Or does Durango become a place where middle-class families can comfortably live?